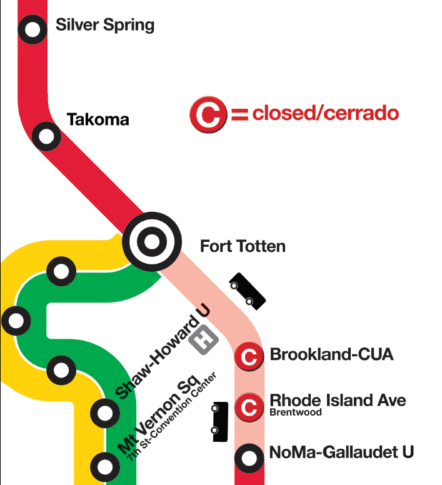 Brookland and Rhode Island Avenue Metro stations are closed for the entire six weeks, with no trains between Fort Totten and NoMa-Gallaudet. WASHINGTON — Tens of thousands of commuters must figure out another way around from July 21 through Labor Day, Sept. 3 as Metro shuts down part of the Red Line for work that is expected to slow traffic far from the two stations that are closed. The focus of the work is crumbling concrete at Rhode Island Avenue that had even fallen toward riders below. Temporary fixes were put in place nearly two years ago, but a bridge structure there remained Metro’s top priority for structural repairs. There will also be other track work done during the shutdown. Due to the shutdown, rush-hour Red Line service will be reduced to every 10 minutes at Fort Totten, Takoma, Silver Spring, Forest Glen, Wheaton and Glenmont. At Shady Grove, Rockville, Twinbrook and White Flint, rush hour service is scheduled to increase to every six minutes. However, there are no additional trains scheduled to run between Grosvenor-Strathmore and NoMa-Gallaudet, so service in that area is scheduled to be reduced from every four minutes to every six minutes at rush hour during the shutdown. Outside of rush hour, Red Line trains will be scheduled every eight minutes in the middle of the day between Shady Grove and NoMa-Gallaudet, which is significantly more frequent than usual. After evening rush, Red Line trains will be scheduled every 15 minutes at all stations that are open. For riders who drive to Red Line stations in Maryland to access downtown D.C., using the west (Shady Grove) side of the Red Line or stations on the Green or Yellow lines may be viable and simple alternatives. Metro suggests parking at Greenbelt, Prince George’s Plaza, Twinbrook or White Flint. Riders should be sure to pay for parking with the SmarTrip card just used to ride the rail system to avoid additional fees. Metro plans to bring back some “rush plus” Yellow Line service during the shutdown, with some rush-hour Yellow Line trains running all the way to Greenbelt during the work zone, which should alleviate some regular crowding through stations such as Columbia Heights and Fort Totten. 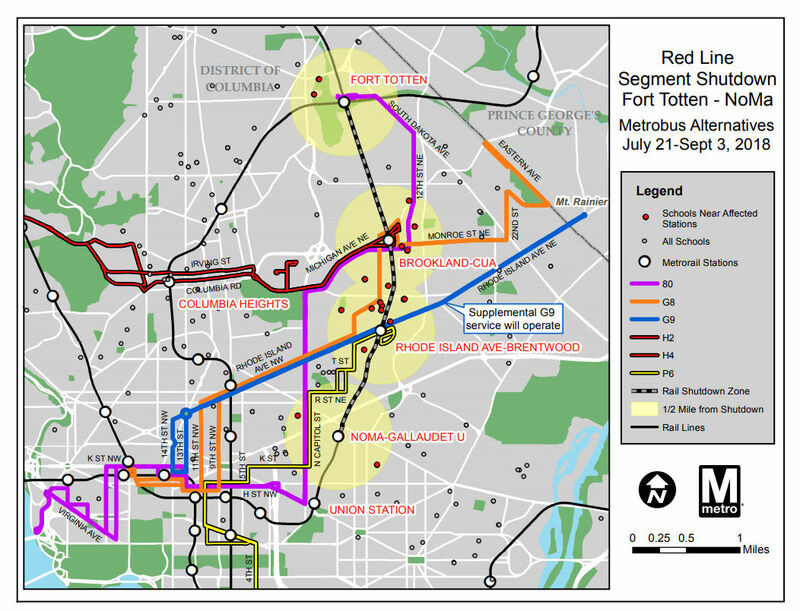 Red Line riders who stick with the rail system’s east side from Glenmont or Silver Spring will most likely be best off transferring to the Green or Yellow lines at Fort Totten to avoid the track work zone entirely. MARC’s Camden Line serves Laurel, Muirkirk, Greenbelt, College Park and Riverdale in both directions at rush hour. MARC’s Brunswick Line runs only toward Union Station in the morning and back to Silver Spring, Kensington, Garrett Park, Rockville, Washington Grove, Gaithersburg and beyond in the afternoon. The Penn Line, which could be farther out of the way for some commuters, runs both directions and also runs on weekends to New Carrollton, Bowie State, Odenton and BWI Marshall. Free shuttle buses during the shutdown are planned to run between Fort Totten, Brookland-CUA, Rhode Island Avenue and NoMa-Gallaudet. 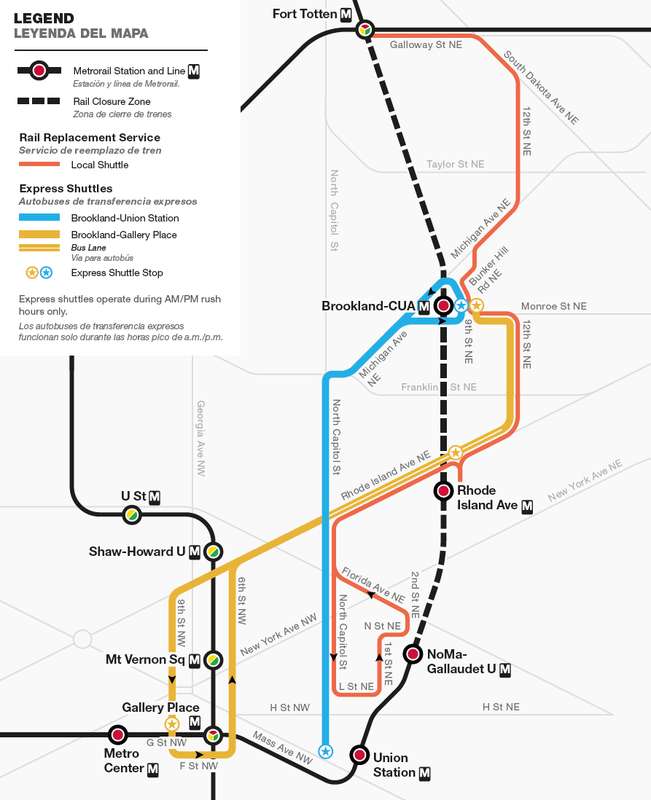 During rush hour only (5 a.m. to 9 a.m. and 3 p.m. to 7 p.m.), separate express shuttle buses are planned between Brookland-CUA and Gallery Place, and between Brookland-CUA and Union Station. Regular bus routes may be better alternatives for many riders, including commuter buses for some riders who typically drive to Metro stations. From Silver Spring, a number of bus routes run downtown, including the limited-stop routes 79 (down Georgia Avenue to Archives) and S9 (down 16th Street to Franklin Square). Note that the 79 no longer allows riders to pay with cash or load money to their SmarTrip cards on board. From Takoma, limited-stop Route 59 runs down 14th Street to and from downtown at rush hour. Along Rhode Island Avenue, the new G9 limited-stop bus will be able to use a temporary dedicated bus lane Monday through Saturday from 7 a.m. to 7 p.m. to zip past traffic to and from downtown. The route will also be extended to run all day long rather than only at rush hour. In addition to parking restrictions for the bus lane, the District Department of Transportation has extended rush-hour restrictions by 30 minutes along North Capitol Street. At Fort Totten, riders could use the E4 bus to Friendship Heights. Route 80 also runs between Fort Totten, Brookland, Union Station, Farragut Square and Foggy Bottom. 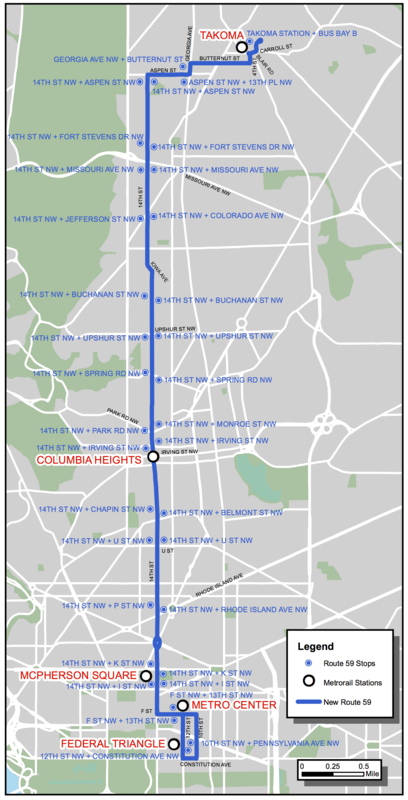 At Brookland, the H2, H3 and H4 run to Columbia Heights, Cleveland Park and Tenleytown. The G8 runs to near Rhode Island Avenue and Farragut Square. Biking and walking could be the smoothest alternatives in many cases — if D.C.’s oppressive summer heat isn’t too much. The Metropolitan Branch Trail runs from near Union Station along the Red Line past Rhode Island Avenue Metro station and Brookland. A number of other quiet streets or bike lanes could also provide backup plans, even if only to reach a stop on the Green or Yellow lines from a Red Line station otherwise hit by the shutdown or a station not hit as hard by the work. Capital Bikeshare continues to offer $2 one-way trips, and dockless bike share and scooters are distributed throughout the city. During the shutdown, Capital Bikeshare will offer corral service (unlimited space for people to dock bikes at the end of their trip and typically additional bikes if needed for people taking bikes out) at 3rd St. and M St. NE weekday mornings rather than at 7th St. and C St. SW near L’Enfant Plaza. Third St. and M St. NE is around the corner from the NoMa-Gallaudet Metro near REI, with nearby access to the Metropolitan Branch Trail to reach Rhode Island Ave. or Brookland. Other corral service also in place from 8 a.m. to 1 p.m. remains at 21st St & I St. NW near Foggy Bottom, 20th St. and E St. NW near the State Department, 17th St. and K St. NW near Farragut Square, 13th St. & New York Ave between McPherson Square and Metro Center, and 7th and F St. NW near Capital One Arena. Metro started the Red Line shutdown after All-Star Game festivities, but it will run through the first two weeks of school in the District, which pays for Metro to provide bus and rail transportation for its students in place of traditional school buses. A Metro map highlights at least 18 schools within ½ mile of a Metro station impacted by the shutdown. Alternatives to some schools, which may require students and teachers to leave much earlier than usual in the morning, include the P6 bus between Anacostia and Rhode Island Avenue station; Route 80 between Fort Totten, Brookland, Union Station and the Kennedy Center; and Route G8 between Avondale and Farragut Square via Brookland and Rhode Island Avenue. Other bus routes may be better alternatives depending on the exact location of home or school. Students at dozens of other schools will be impacted during the first week of class by the separate round-the-clock work zone on the Blue, Orange and Silver lines scheduled Aug. 11-26. On weekends, Metro plans to run Red Line trains between Shady Grove and NoMa-Gallaudet every eight minutes during the shutdown, which is more frequently than usual. Evenings and at night, trains are scheduled every 15 minutes on weekends. Between Glenmont and Fort Totten, trains are expected every 10 minutes during the day on weekends and every 15 minutes at night. On weekends, only local shuttle buses are planned, which will stop at Fort Totten, Brookland-CUA, Rhode Island Avenue and NoMa-Gallaudet. The weekend of July 28-29 only, the shutdown will extend to also close Takoma station and the Red Line platform at Fort Totten. Shuttle buses will run July 28-29 between Silver Spring, Fort Totten, Takoma, Brookland-CUA, Rhode Island Avenue and NoMa-Gallaudet. Riders at Silver Spring those days should take regular bus routes rather than the shuttle buses to reach other rail lines, other parts of the Red Line or their final destination. On all weekends during the shutdown, Metro will continue to run G9 limited-stop service down Rhode Island Avenue. Metro riders do not even have to wait for this shutdown to be over before the next round-the-clock work zone begins. Part of the Blue Line will be shut down from Aug. 11-26, and trains on the Silver and Orange lines will be scheduled only every 20 minutes each over the length of each line. Metro expects to do track work in a curve between McPherson Square and Smithsonian that requires two weeks of single-tracking. Alternatives include Virginia Railway Express, MARC, commuter buses, regular bus routes and the Green or Yellow lines, in addition to biking or walking.